Extra Tasty Crispy Chicken recipe by Hiba Peracha at DesiRecipes.com. 1. Trim excess fat from niblet pieces. Preheat oil in a deep fryer (or Karahi with lid) to 170 degrees. 2. Combine water, salt and chinese salt for the marinade in a large bowl. Add the chicken and let it sit for 20 minutes, turning occasionally. 3. Combine the beaten egg and milk in a medium bowl. In another medium bowl combine the rest of the coating ingredients ( flour, salt , pepper and chinese salt ). 4. When the chicken has marinated, dry between paper towels. Coat each piece separately. Dip into flour, then egg and then finally coat with flour once more. Stack each piece on a plate until all pieces have been coated. 5. Fry about 4 to 5 pieces of chicken at a time in the deep fryer. DO NOT lift the basket up because the chicken will stick and coating will rip apart when you try to remove it. 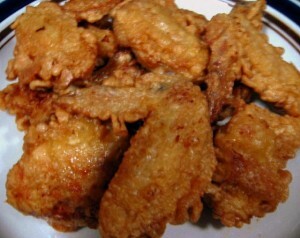 Fry until golden brown (12 to 15 minutes). Turn halfway through to cook evenly. 6. Remove the chicken to a rack or paper towels to drain for 5 minutes before eating.